The Naqab, the southern region of historic Palestine, is increasingly becoming an established site of interest and research within Palestine studies and, more broadly, studies of marginalised populations in the Middle East that offer more nuanced approaches towards understanding these groups without resorting to well-trodden Orientalist tropes. 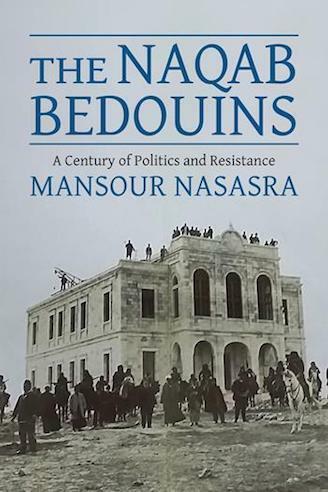 Mansour Nasasra’s book falls within this expanding body of scholarship and contributes to it by providing a fresh narrative of Naqab Bedouins, presenting them as active agents under late Ottoman, British and Israeli military rule. Building his argument on the notion of power as relational and resistance as an intentional act, Nasasra chronicles Bedouin history and politics across the last century and portrays acts of resistance as diverse and dispersed, but as centrally concerned with confronting state hegemony and settler colonialism. In doing so, Nasasra deconstructs the passive, docile Bedouin stereotype that has pervaded much of Israeli scholarship on the Naqab Bedouins as well as depictions elsewhere. Instead, he focuses on how this community responded to control and rule by different powers in the twentieth century, particularly the control exerted by Israel between 1948 and today in order, as he writes, to “deepen the understanding of the Bedouin as an organic part of the Palestinian indigenous minority in Israel and by bringing in an original view to fill the gap in the literature left by many other scholars,” (p. 2). By foregrounding agency in his study, he shows that the indigenous community adopted a wide and varied range of methods of resistance, including non-violent, political and cultural forms that spanned a century and that gathered pace from the beginning of Israeli military rule until today. For his book, Nasasra draws on British and Israeli archival materials balanced by oral history approaches in order to describe different periods of Naqab history while emphasising the means of resistance deployed by those Palestinians who remained after the mass Nakba expulsion of 1948. His depiction of the Naqab Bedouins is of a community engaged in a continuous everyday struggle with the state, thus pre-empting any arguments suggesting that the increasingly visible and publicised indigenous acts of resistance by this community are a new phenomenon attributed to younger generations and, as such, are non-representative of the Naqab Bedouin community’s supposed historical amicability to the Israeli regime. Furthermore, his account provides a fresh reading of Bedouin politics and history since the Nakba of 1948, thus filling a gap in knowledge that had contributed to long-held misunderstandings about their relationship to state power. In his readable and well-sourced account, Nasasra shows that the Bedouin community has constantly challenged power, employing every possible mechanism to affirm its right to place, the continuation of its cultural identity and the community’s right to political voice. As the author notes, the book contributes to the debates on Bedouin communities in four distinct ways. First, it contributes to the debates about the late Ottoman era by addressing the nature of the relationship between the Bedouins and Ottoman government in Istanbul; second, it proposes a new understanding of British colonial rule in southern Palestine and indigenous relations with colonial rulers, comparing these with the dynamics between the colonial state and Bedouin communities in other frontier regions, such as Transjordan, Sinai and Beersheba; third, it examines Bedouin-Israeli state relations from 1948 to 1967 and then to the present, providing a new reading of the debates about Bedouin indigenous rights and land ownership and finally it focuses on the Bedouin communities’ continuous struggle for recognition since the Oslo peace agreements, focusing on the recent Israeli “Prawer Plan” to relocate around 40,000 Bedouin away from their historical villages and land. Broadly speaking, the book, though focusing on the Naqab Bedouin, contributes toward an emerging de-colonising research agenda revolving around themes of knowledge production from below that reject dominant colonial narratives about the Naqab. From the beginning, Nasasra prepares the reader for the conclusion, suggesting that while the Israeli brand of settler-colonialism has displacement and replacement at its roots, indigenous and native people pose a serious challenge to settler states by continuing to live on their land, refusing to relinquish their historical claims and engaging in non-violent forms of resistance, ranging from non-cooperation with their Israeli military rulers to the public protests against the infamous Prawer Plan in 2013. By considering power as relational, Nasasra debunks arguments that the Naqab Bedouin were ever passive and powerless, depicting them instead as active actors in their history. For Nasasra, the most effective tactic was non-cooperation with Israeli military rule, which, with time, would evolve into more politically organised action to gain more rights. What broader lessons can be learned from these acts against a powerful settler-colonial entity such as Israel remains an unanswered and difficult question, particularly for Palestinian refugees unable to return to their homeland and other Palestinians living under an extreme form of settler colonialism. What is answered, however, is the question of who the Naqab Bedouins are and why it is important to rewrite their history. Dina Matar is Head of the Centre for Global Media and Communications at the School of Oriental and African Studies, University of London, and a Senior Visiting Fellow at the LSE Middle East Centre. She is the author of What it Means to be Palestinian: Stories of Palestinian Peoplehood, co-author of The Hizbullah Phenomenon: Politics and Communication and co-editor of Gaza as Metaphor. She is co-founder and co-editor of the Middle East Journal of Culture and Communication.